A legendary fashion designer for Barbie shares the story of her adventures working behind-the-scenes at Mattel, and spotlights the creations that transformed the world’s most famous doll into a style icon in this beautifully designed book—published in commemoration of Barbie’s sixtieth anniversary—illustrated with 100 full-color photographs, including many never-before-seen images of rare and one-of-a-kind pieces from the author’s private archive. Dressing Barbie is a dazzling celebration of the clothes that made America’s favorite doll, and the incredible woman behind them. For thirty-five years, Carol Spencer enjoyed an unparalleled reign as a Barbie fashion designer, creating some of Barbie’s most iconic looks from the early 1960s until the late 1990s. Barbie’s wide-ranging wardrobe—including princess gowns and daisy-print rompers, flirty sundresses and smart pantsuits— combined fashion trends and haute couture with a liberal dose of fantasy. 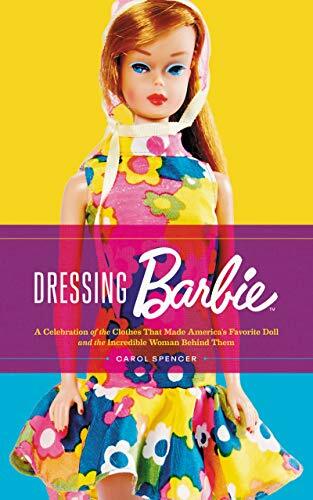 In Dressing Barbie, the successful and prolific designer reminisces about her time at Mattel working with legendary figures such as Ruth Handler, Barbie’s creator, and Charlotte Johnson, the original Barbie designer, and talks about her best and most beloved clothing designs from each decade. But Carol’s most impressive creation is her own life. As Handler famously said, “Barbie always represented the fact that a girl has choices”—a credo Carol epitomized. In Dressing Barbie, she talks candidly about how she broke free of the constraints of the late 1950s to pursue a dazzling career and an independent life for herself. Over the course of her successful and prolific career, Carol won many accolades. She was the first designer to have her signature on the doll, the first to go on a signing tour, the first to design a limited-edition Barbie Doll for collectors, and the designer of the biggest selling Barbie of all time. Now, Carol is the first member of the inner circle to take fans behind the pink curtain, revealing the fashion world of Barbie, the quintessential California girl, as never before.